This auditorium installation features a coffered ceiling, recessed lighting fixtures, air vents and grid mount speakers. Our club room was completed on June 5, 2006, and the ceiling looks awesome. 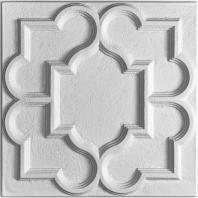 The ceiling tiles are easy to install, and the price was great.